After the Soyami Bloggers Night event last Wednesday, I decided to try to be more healthy. The night was not just an awarding of the Soyami Blogging Contest winners, but also a celebration of healthy lifestyle. It was held in Tourne' in The Fort Strip, and as soon as I arrived in the venue - here's what greeted me. and Fitness First free work-out sessions too! It was my first time in Tourne' but I had read good reviews about the place. This is the restaurant that focuses on offering Slow Food (opposite of Fast Food). Chef Sandralyn Hataway even prepared special menu for us during the event. But before we go to the food, let me start with the Appetizer - and appetizer I meant Marc Nelson who hosted the event. I admit that he is one of the reasons why I went to the event (evil smile here). The first time I met him was during the Yahoo OMG Awards. And I told him he is my crushie. I guess he's used to hearing that line. With a body and face like that, I am sure he is used to girls' attention. But of course, I behaved that night :) He is witty, charming and a natural. He is such a great host that he handled even technical difficulties with flair and style. 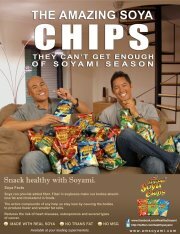 Marc admitted that he is a Soyami addict. He said it was like an answered prayer when he first encountered the good snack. And it is nice that he is not just an endorser but a believer and ambassador of the product. Before the awarding, a dietitian from Fitness First Club talked about health and fitness, and how we can attain both. And to ensure that we will eat without guilt that night, Tourne' served us with dishes incorporated with Soyami products. I love the Spicy Sesame Noodles with Soyami Nuts & Thai Basil Salad and Mac and Cheese with Soyami and Alugbati! For some reason, Chef placed alot of food in my plate. People honestly think I should eat more.. While everyone was lining up in the buffet table, we had our picture taken with Marc at the photo booth! Here's what we had for dessert. Don't ask me what it is called - all I know it is good! I forgot my name and its name because it is soo good! During the entire event, they raffled off alot of prizes. Too bad I didn't win any. I wish they included a date with Marc Nelson as the grand prize. There were also friends from the TreeHugger (I featured them in my Blogapalooza post) and FaceOne who joined the event. The materials of the pen are made of recycled items (like old newspaper and cartons). Best part, every pen sold contributes to the reforestation of the Philippine forests through Haribon Foundation's Give A Gift Tree drive. The pens and pencil look so cute, I don't want to use them! Whitening Set from FaceOne. What makes it more special? It uses the Stem Cell Technology - a stem cell from a rare apple (UTTWILER SPATTLAUBER) rich in epigenetic factors which guarantee the longevity of skin cells. I hope this works best for my skin. I am not the type which uses every available product in the market, but this one I have to try. Btw, I love the names they created for each product! I may not have won anything, but the best take-aways are not the goodies, but the new inspiration to stay fitter and healthier. As a matter of fact, I decided to grab Soyami instead of usual snacks yesterday in the grocery. I am loving the Somayi White Cheddar flavour. My coworkers begged for Soyami goodies (I reported to work after events) - I gave them the Original flavor and a pack of Soyami Styx. Call me selfish, I love my Soyami! :D The Soyami Styx goes well with Jalapeno Cheese Dip (I just have to share). DJ Rico Robles of RX 93.1 (who showed us his brick game!) , DJ Mojo and DJ Jessica Mendoza of Magic 89.9. Ashley’s Playlist and Happy Endings will be hosted by singer-photographer-Cosplayer Ashley Gosiengfiao and RX DJ/model Karen Bordador. Thanks to BloggerManila for putting me on the guest list and dragging me to the event. Spent most of the time catching up with friends and talking about love stories. I were like Cinderella when I said good bye and headed to the office. Like TreehuggerWorld and FaceOne on Facebook.